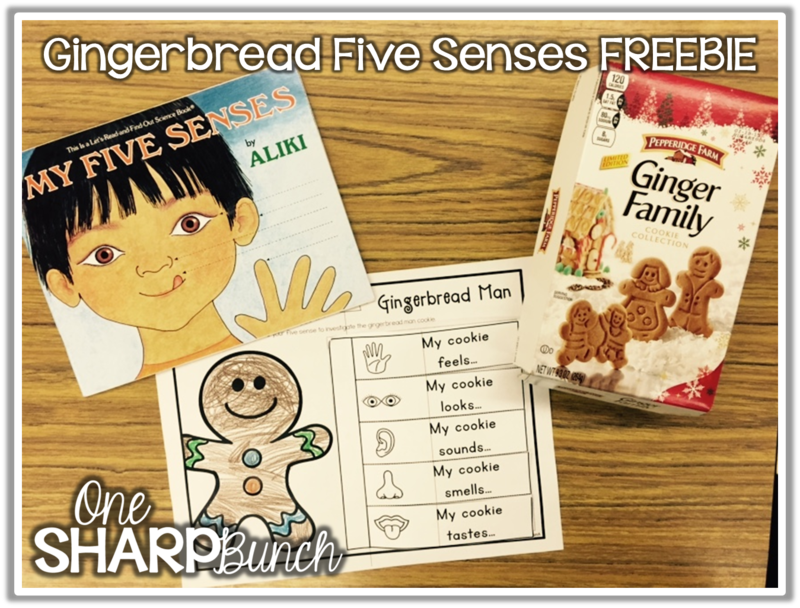 Since I knew the kiddos would be drooling over their gingerbread houses and wouldn’t be able to wait to sample them, I whipped up this five senses activity to use with actual gingerbread cookies. Let’s just say the kiddos were super excited to begin investigating the gingerbread cookies using their five senses! First, I read My Five Senses by Aliki. As we read, we created a little anchor chart that we could use once we began investigating our gingerbread cookies. Then, we held the cookie and used our sense of touch to describe it. I was super impressed with their answers… hard, bumpy, sandy, and smooth. We also used our sense of sight and smell to investigate the gingerbread cookie. Check out how the student responded using her sense of smell! If you’d like to give this activity a try in your classroom, click on the picture below! Don’t forget it… pin it! Feel free to pin any of the images above and this image too! This might be a fun holiday party activity, or even just a fun last-day-before-break activity! Speaking of holiday parties, I blogged about my holiday party yesterday. Does your school allow parties? Check out my party by clicking on this image! I also blogged all about our annual Gingerbread House Workshop over at The Primary Pack today! Head on over to see the workshop in action! Plus, you can read all about how we retell the Gingerbread Man using this FREE emergent reader! Anyhow, happy investigating… and tasting! YUM! Very cute! Thanks for sharing! We tasted a gingerbread cookie last week. My students never had gingerbread and they all liked it. We also used our 5 senses as we are finishing up that unit. Our school has 2 parties a year-Christmas and Valentine's. We have room moms who plan, then come in to have the parties. They do a craft, snack, game, and open gifts. Teachers are there to assist. A bunch of my kiddos hadn't ever tried gingerbread either! I am glad that we were able to investigate them in class. Don't you just love room moms?!?! I usually ask for needed donations and organize the centers, but I have parent volunteers run each center. Thanks for stopping by! Thanks so much for sharing! We are making Gingerbread cookies on Wednesday so this will be a perfect addition. Have a great week! Yay! Glad you could use this, Laura! Thank you very much for sharing. I can't wait to try it with my students.